Channels are used for grouping joints. They allow animations to play only on a subset of the model joints, so that multiple animations can play on different parts of the model at the same time. For example, you can play a walking animation on the legs, an animation for swinging the arms on the upper body, and an animation for moving the eyes on the head. 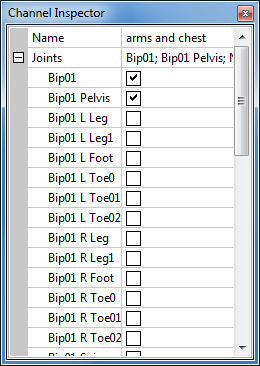 Animation channels are defined and inspected in the Model Editor as described below. The use of channels is up to the game's script or C++ code. 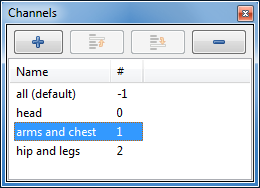 The Channels pane lists all animation channels in the model. A single click on a channel selects it, a double click opens the Channel Inspector pane as well. Pressing the F2 key or a single-click on an already selected channel allows you to rename the channel in place. The “+” button creates a new channel and adds it to the list. The “-” button deletes the currently selected channels. Inspect/Edit opens the Channel Inspector pane. Rename allows to rename the animation channel. Add/create new, like the “+” button, creates a new channel and adds it to the list. The Channel Inspector pane shows the details of the currently selected channel. Shows the name of the currently selected animation channel. The name can be edited in order to rename the channel. Select for each individual joint whether it will be a member of the channel. When the game code plays an animation on this channel, the animation will only affect joints that are a member of the channel.